A Voyage round the World, in His Britannic Majesty's Ship, Resolution, commanded by Capt. James Cook, during the Years 1772, 3, 4, and 5. London: for B.White, J.Robson, P.Elmsley and G.Robinson, 1777. 2 volumes, 4° (290 x 235mm). Folding engraved map. (a2-3 in vol.I loosely inserted, single worm hole at inner blank margin of vol.II from Dd1 onwards, occasional light spotting.) Modern stained calf-backed marbled boards. Provenance: Augustus Henry, third Duke of Grafton (1735-1811, armorial bookplate, inscription in vol.I 'D.of Grafton/1777'). 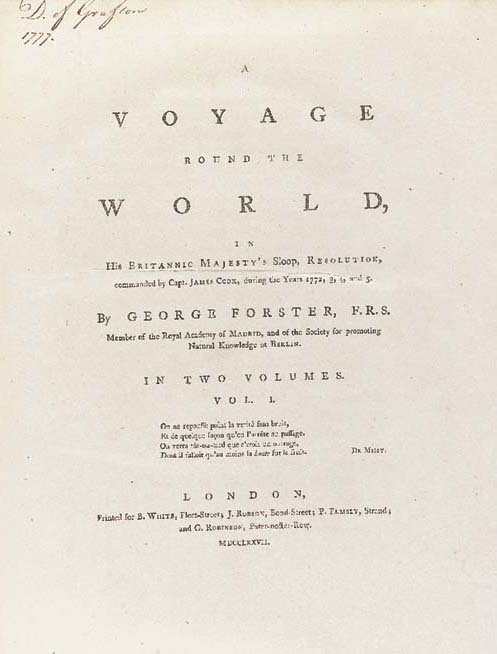 FIRST EDITION OF THIS 'IMPORTANT AND NECCESSARY ADDITION' TO THE OFFICIAL ACCOUNT OF CAPTAIN JAMES COOK'S SECOND CIRCUMNAVIGATION. 'In this expedition's three years, Cook made the first circumnavigation of the [Antarctic] continent and the first documented crossings of the Antarctic circle... On 30 January 1774, Cook reached his furthest south at 71° 10'S, 106° 54'W. Although he approached the continent to within 50 to 100 miles... he never saw or claimed to see the continent. The voyage's principal contribution to Antarctic exploration was to reduce the possible extent of a southern continent and to disabuse the notion of a tropical climate in high southern latitudes. Cook rediscovered South Georgia in January 1775 and discovered the Sandwich Islands.' (Conrad).